I freely admit that I love the Tony Awards. I look forward to them all year. Yes, that might be extremely nerdy of me to admit, but so what?! Big whoop? You want to fight about it?! Having never been to New York (the sniffling begins), the Tony's happen to be the closest way I get to experience Broadway. So, I'll take the trash talk and the being made fun of in order to get to experience it, even if just for a night. But I tell him that if I can watch football for 6 months, he can give me 1 night and watch the Tony's with me. He played on his computer most of the night. It seems that every star in Hollywood wants to come and be on Broadway (not that I blame them. I want to be on Broadway). So, naturally, in order to entice more Hollywood names (that will bring in money) to Broadway, we must give them Tony Awards, so they'll tell their friends to come to Broadway, because they give you an award if your name is big enough. This year Denzel Washington, Scarlett Johansson, Kelsey Grammer, Jude Law, and Sean Hayes (who hosted) all made their Broadway debutes this past year. And every single one of them were nominated for Tony Awards. And Denzel and Scarlett won. See, here's the thing. It's not that I don't think these people are talented (I thoroughly believe that Catherine deserved to win her Oscar for Chicago), but I just hate it when people from Hollywood come and take over from the big names that only those of us who are true fans and love Broadway would recognize. 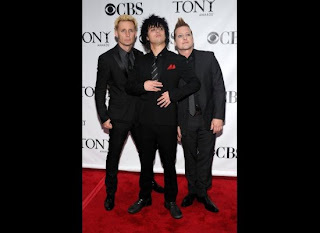 But you would think Mike would have been some-what entertained, because Green Day's musical American Idiot was nominated and performed last night. And he likes Green Day. Although American Idiot didn't take home the prize for Best New Musical (Memphis took that honor), it just goes to show that there really are no original ideas anymore (ahem, Spiderman, the Musical?! Yes, I'm serious. It was supposed to make it to Broadway last year, but has been postponed . . . and postponed . . . and postponed). All in all, I think the Tony's were slightly disappointing this year. But, I still find it hard to wait another 365 days until I get to "go to" Broadway again. Maybe this year Mike will actually take me to the real Great White Way (hint! ).